The giveaway will be for a huge variety box of Pretzel Crisps® to one lucky reader of The Nutritionist Reviews. The giveaway is open until Midnight on Tuesday August 9th. Winner will be chosen on Wednesday August 10th using Random.org. The winner will have 48 hours to respond or a new winner will be chosen. 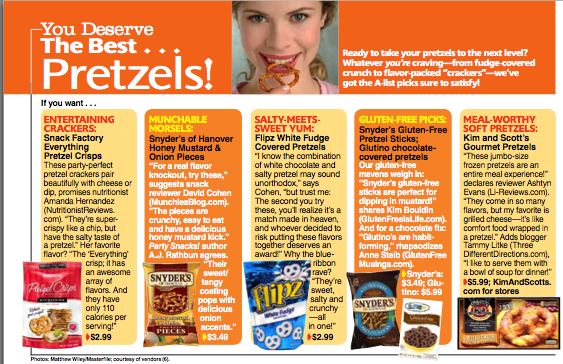 Visit the Pretzel Crisps® website and let me know which flavor that you want to try the most! -Like Pretzel Crisps on Facebook (1 entry). 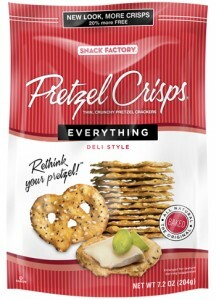 -Write on the Pretzel Crisps Facebook page that The Nutritionist Reviews sent you (1 entry). My favorite flavor is the sesame, and I like to eat them plain. #1 I "Like" my Facebook as Kelly Ann T.
#2 I "Like" my Facebook as Kelly Ann T.
I would love to try Pretzel Crisps' Sesame flavor. I'd love to try the everything! I would like to try the Everything variety. Pretzel Crisps Everything is the flavor I would like to try the most! I would like to try the Garlic Parmesean! In the fruit bar giveaway! I'm a purist. I'd like the Original. I entered your That's It giveaway. I want to try the Buffalo Wing flavor! I entered the That's It Fruit Bar giveaway. Came over from the Sunday Pink Dandy Sunday Blog Hop. Great Blog you have. I like the Buffalo Style. I want to try the Cinnamon Toast!! I would like to try the Deli Style Buffalo Wing flavor. I like Pretzel Crisps on FB as Anne Loyd. The Everything pretzels sound amazing! I like Pretzel Crisps on facebook as Alison Faith Tolar. I told Pretzel Crisps that you sent me. I'd love to try the Everything Pretzel Crisps. I would like to try the Garlic Parmesan and the Everything..thanks!! Buffalo wing sounds great.Thanks for the chance. I would love to try the Cinnamon Toast. The cinnamon toast flavor sounds really good. would love to try dark chocolate and peppermint!! said you sent me on pretzel crisps facebook page! I want to try the Cinnamon Toast pretzel crisps! Entered your That's it. giveaway. I would love to try the Dark Chocolate & Peppermint and Garlic Parmesan flavors. I like Pretzel Crisps on Facebook user Lisa Garner. I let Pretzel Crisps know you sent me user Lisa Garner. Garlic Parmesan is my flavor of choice! I would most like to try the garlic parmesean. I am The Nutritionist Reviews GFC Follower! The Garlic Parmesan looks really good! I like Pretzel Crisps on FB. I really want to try the Garlic Parmesan. I entered the Mowhawk rug giveaway. I wanna try the classic. I want to try the everything variety! I would love to try their Deli Style Buffalo Wing flavor.